When they first see bubble tea, many people are curious about the bright colors these drinks often have, as well as the spheres that sit at the bottom of the cup. However, trying this drink for the first time is even more of an experience. Watch this video to see Irish people trying their first bubble teas. The taste testers were first given classic bubble tea to try, which is made using black tea, milk, sweetener, and tapioca pearls, which are the spheres that rest at the bottom of the cup. Next, the group tried pomegranate, blueberry, matcha, and mint bubble teas. Happy TeaHouse & Café is open late, offers free wi-fi for customers, and serves teas, smoothies, food, and snacks. To contact our bubble tea house in Houston, call (713) 469-3275. What Is the Difference Between Clear and Black Tapioca Pearls? Do you love to drink bubble tea? If so, then you may have had the opportunity to try both clear and black tapioca pearls. Many people wonder what the difference is between these bubble tea components. Clear tapioca pearls are made from starch that comes from cassava root. This starch is used as a thickening agent in a variety of foods and is incredibly versatile due to its clear, translucent appearance. To give tapioca pearls their dark color, brown sugar is added. The sugar gives the pearls a richer hue and adds sweetness. Because it gives them a more visible appearance and often a sweeter flavor, black tapioca pearls are commonly used to make bubble tea. At our tea house serving Houston, we prepare fresh tapioca 2 or 3 times each day to make our bubble teas. To find out more about our menu or location , please call Happy TeaHouse & Café at (713) 469-3275. What Are Bubble Tea Jellies? When you stop by your local tea house to order bubble tea, you may notice that there is an option to add jellies to your drink. If you’ve ever wondered about these ingredients, then watch this video to learn about bubble tea jellies. 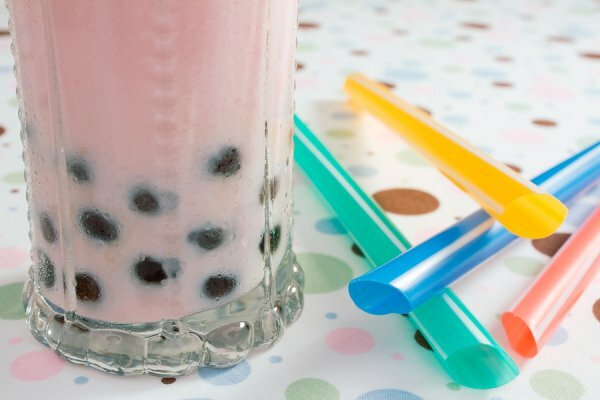 Many jellies that you can add to your bubble tea have the same consistency as boba pearls, but they come in different colors, shapes, and flavors. Some of the varieties that you might find include lychee, passion fruit, and strawberry. Are you ready to give bubble tea jellies a try? If so, then come by and see us at Happy TeaHouse & Café . We serve delicious snacks, smoothies, and bubble teas near Houston. To learn more, give us a call at (713) 469-3275.